Just frog ’em all. Froggity frog frog frog. Then, you can cast on for something new with a clear conscience! I made the decision to rip out (ribbit) my Color Dipped Hat (thanks for all the advice). I haven’t actually done it yet, but I will. That one I will restart, but I guess I got the frog bug because I just decided to deep six another project that was giving me headaches. The Lacy Loo just was not going to work in Berroco Linet. Just not happening. So, that one will get ripped out too and I’ll keep my eye out for a better yarn choice for the pattern. I also decided to scrap a dishcloth I cast on a couple months ago as I have no idea where I was in the pattern, and not a ton of interest in dishcloths at the moment. So there! Two WIPs gone and one on the way to recovery! 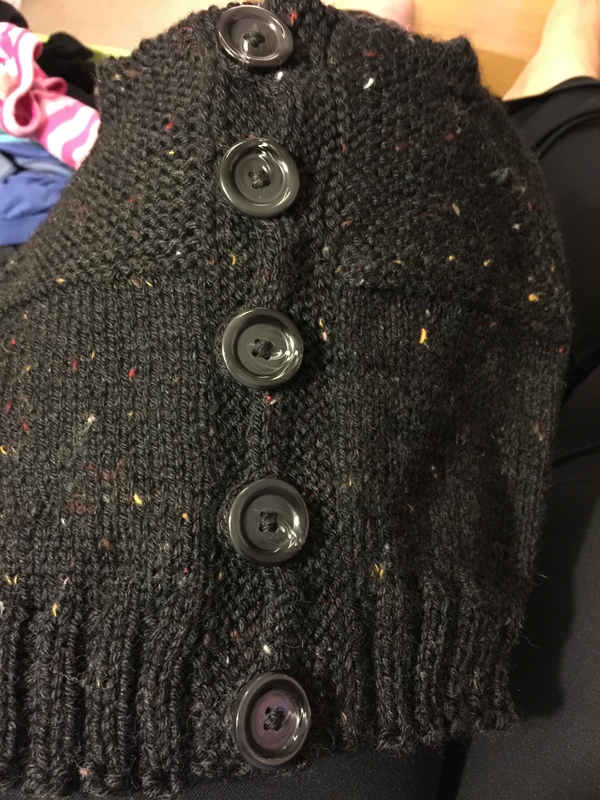 Of note, I used TECHknitter’s button shanking technique. 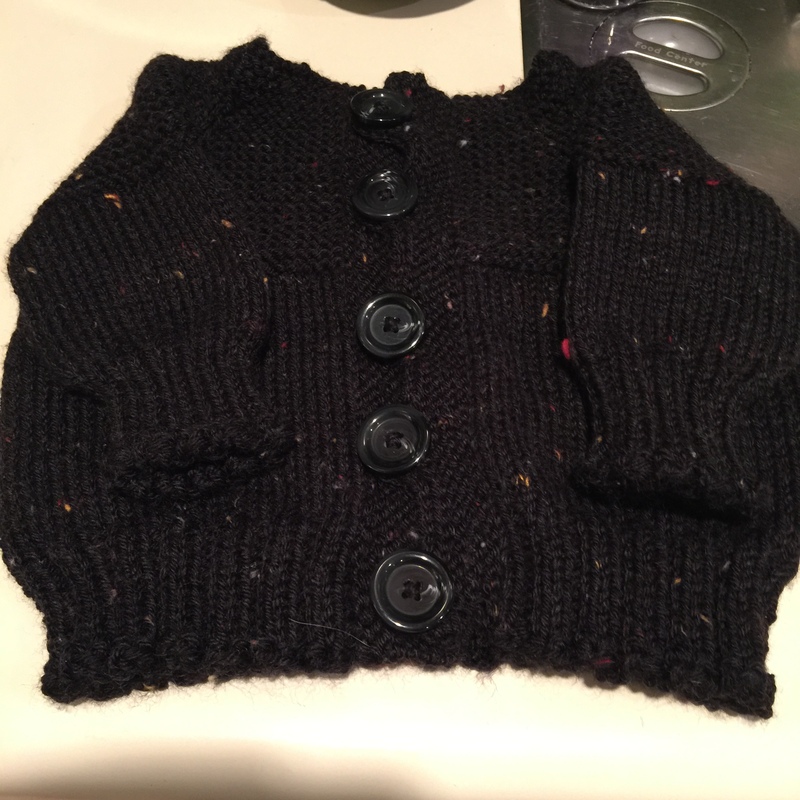 Black yarn is really tricky to photograph. Once it is done drying, I’ll try to get some shots in natural light that are a little clearer. I’m really happy with how it turned out. 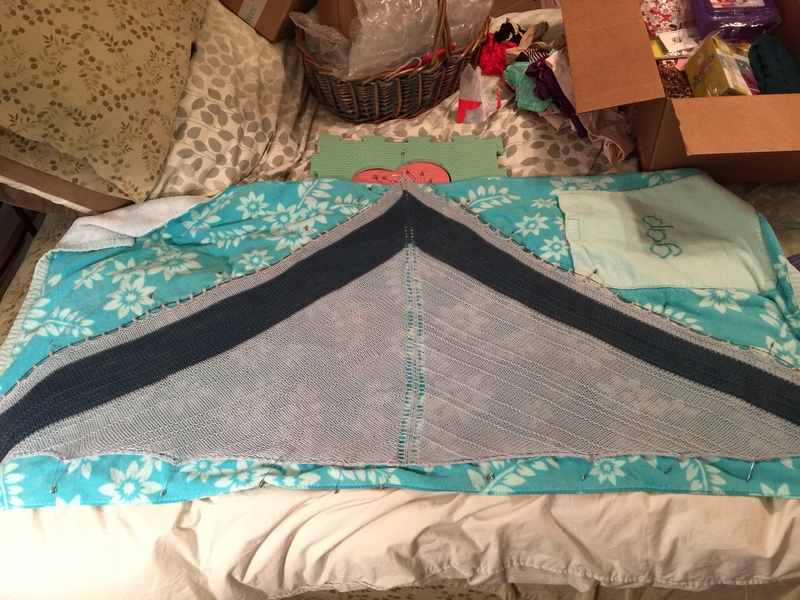 I of course forgot to take pre-blocking measurements, but it grew a lot. I hope the recipient likes it! I should be able to give it to her this week. Oh yeah, and I straight up finished another WIP. 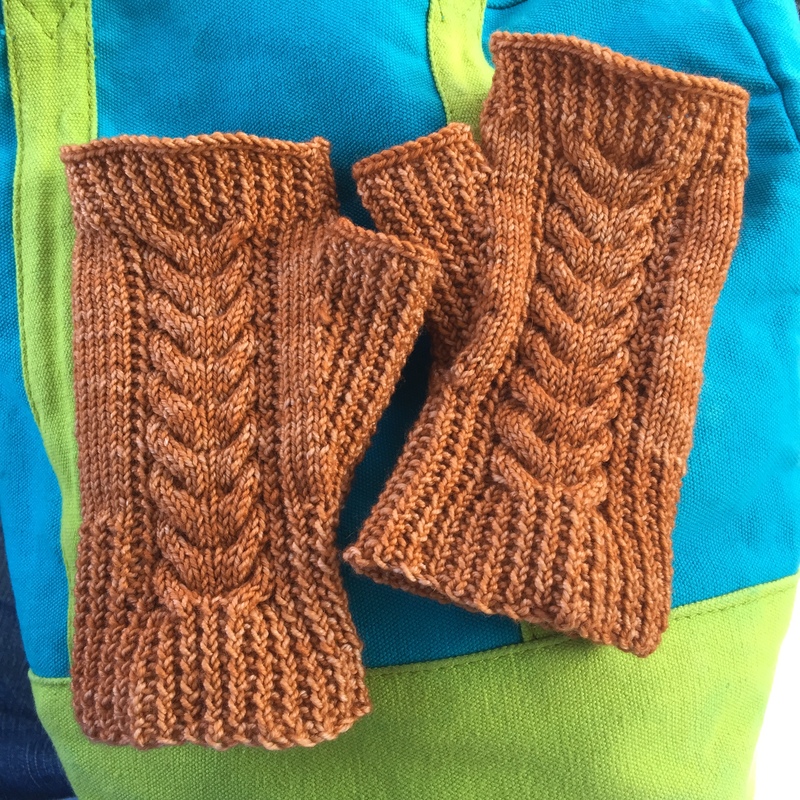 Say hi to my third pair of Passport Mitts! I made them out of the same orange Ella Rae Lace Merino DK. These are the size large but like the other orange pair, I stuck with US2s the whole time instead of switching to 3s. This yarn is just not anything close to DK weight and I like the way the knitted fabric was with the 2s. Also, the intended recipient wants a snug fit. I think they’re just about perfect! So, I’m down to six WIPs. Two are blocking and will be done within a day or two. One is my Drachenfels which I still just haven’t blocked and taken final photos of. I really just want to wear it all the time so I don’t want it out of commission for a couple of days! Plus, to block it, I’d have to legitimately clean off the guest bed and that hasn’t been high on my priority list. I’m left with the Color Dipped Hat which is back to square one and two old-ish WIPs just waiting around for some finishing. Capucine needs tassels and Twirly Summerskirt needs elastic in the waistband. You know what the next question is, right? What should I cast on next? Well, I swatched for Hermione’s Everyday Socks the other day and came in closer to 8 sts/inch than 9. I was even using US1s! I thought about casting on anyway because I would need to adjust the pattern for my big feet, but I’m starting to wonder if that’s the best next sock pattern for me. I kind of want something with more explicit instructions for how to make size adjustments, or at least something that offers different sizes so that I can see more clearly how to manipulate things. I stumbled across a link to get a free Craftsy.com class the other day and chose to use it on a sock class. I think I might watch that before I start my next sock project. So, what else is on my queue? A few things, but nothing I’m ready to start yet. I guess I’ll just commence with the frogging! May your frogging bring you relief. I love your tidy bed. My house is similarly tidy. Anyway, between the frogging and the finishing, maybe your blogging username should be changed to WIP-Killer! I do really like the Passport Mitts, but my current frenzy will die down after the KAL ends in a couple of weeks 🙂 Plus I don’t think I’m up for doing the math to convert them yet. After I’ve done a couple more pairs of socks I think I’ll have a more solid understanding of the construction, and will be more willing to modify stuff. Almost an anti knitting campaign you’ve got going on! ☺ Eliminate all knitting! There are some projects out there that I know must be frogged but I postpone…. I need to be brave, as you say, it is for the best. I can make something new with a clear conscience! Ha! Not ALL knitting, just the projects that were causing angst 🙂 I ripped the hat today and restarted it. I’m trying to give it the opportunity to behave. You are a most generous knitter, I hope your yarn realises this one day and cooperates. ☺ I’m waiting for that bad day, so I can come home and do some frogging, a new form of therapy perhaps!